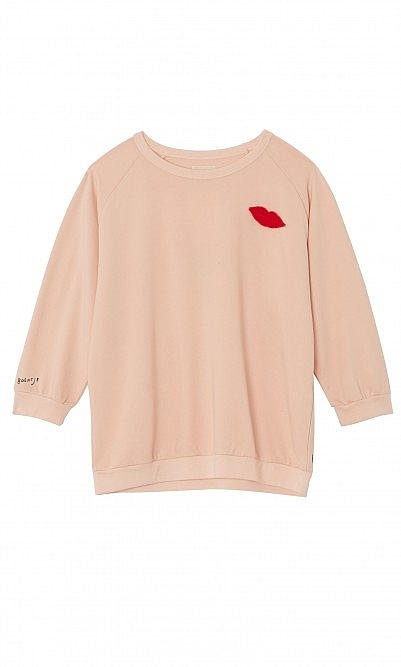 Soft pink sweatshirt with felt lips applique. Sweater fit with cropped sleeves. L60cm. Fabric and care: 45% Viscose 35% Cotton 18% Polyester 2% Elastane. Cool wash. Perfect for the weather right now. Bought it in the sale, am very pleased with it. The sleeves are just in between, not long or short. The top is very comfortable to wear, the colour is flattering. Just a little flush of apricot/pink.